There are several reasons why an anti-reverse is necessary, and why the ability to turn it on and off is important. The first is practicality. 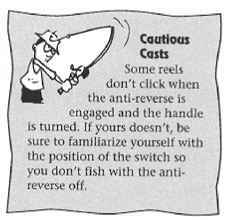 If no anti-reverse existed, and the handle was free to turn backwards at all times, the angler would have to maintain a very tight grip on the reel handle at all times when fishing. With the anti-reverse on, you can hold onto the rod with just one hand when fishing and still maintain a tight line. This may not sound so necessary when sitting in a comfortable chair in a climate-controlled room, but when you are fishing, there are plenty of reasons to do so. You want to put a piece of gum in your mouth or hand a friend a worm (and you certainly don't want to confuse the two). Or you want to adjust your hat or throw your hand out for balance. The second reason: When you're playing a fish, there are times when you do not want to reel in and simply let the fish run and jump. This is when you want the reel's drag (covered in the following section) to take over. With no anti-reverse mechanism, the drag wouldn't function and the reel's handle would spin backwards as line would peel off the spool. Stop it too forcefully and the line might break. And how would you be able to grab a fish or net it if you needed both hands on the rod at all times? Reels are not made in permanent anti-reverse mode because there are times when you want to let line out by turning the handle backwardsto adjust the amount of line hanging from the rod tip before a cast, say, or to increase the amount of line in the water when fishing with live bait. 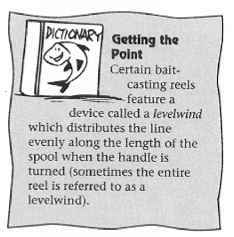 As a rule, though, the anti-reverse mechanism should be engaged when you are actively fishing, as long as the reel's drag is set properly. The drag of a reel is an adjustable mechanism that controls the amount of line coming off the spool when the anti-reverse is engaged, or when it is not engaged and the angler is holding the reel handle still. Drags allow a hooked fish to take line out under pressure without the line breaking. This allows the angler to play a fish without having to worry about when to give the fish line, because the drag does it automatically. Drag systems differ from reel to reel. Generally, they consist of washer-like disks stacked under spring pressure. That amount of pressure should be adjusted by the angler to a point under the breaking strength of the line. The drag adjustment device on most baitcasting reels and on some spincasting reels is often a flat, star-shaped piece of metal or plastic (called a star drag) at the base of the reel's handle. Some baitcasters feature a lever that adjusts drag. On spinning reels, the drag adjustment is either a turning cap on the top of the spool or a knob at the back of the spinning reel housing. Turning the star, lever, cap, or knob in one direction increases the amount of dragthat is, it applies more pressure and makes it increasingly difficult for line to come off the reel. Tightened all the way, drag is eliminatedresulting in a line with no give that could be snapped by a fish. Turning the drag device in the other way decreases the amount of drag. 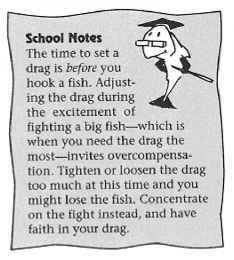 Drag works because, when you are playing a fish, it often runs and lunges and dives erratically. If the fish is especially large for the rod and reeland thus the line strengthyou are using, the fish could very well break the line. 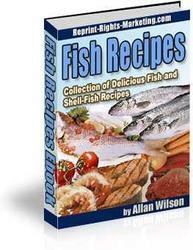 Usually you can't move the rod or run after the fish to adjust for such movement. 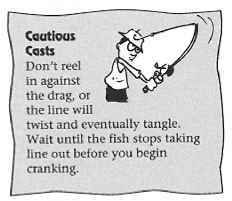 Putting the reel in freespool and letting the fish take line unhindered would allow the fish to throw the hook or wrap the line around an underwater obstruction (which happens often enough even with a tight line). So the drag takes over, letting the fish take line when it has to, all the time allowing you to maintain control of the fish. Drag works only if it is adjusted properly for the line on the reel. 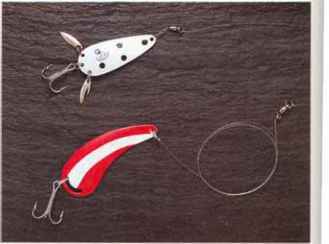 For instance, if you are fishing with 6-pound-test line, which means the line won't break unless there is a minimum of 6 pounds of pressure on it (details are in Chapter 7), your drag should be set for 3 or 4 pounds. There is no standard rule for the amount of drag necessary, but the common belief is that it should be set strong enough to set the hook on a fish without giving up line, but not so tight that line comes off the reel grudgingly when you pull it by hand. Also, because knots actually reduce the strength of fishing line, you should adjust your drag to compensate.